Who wouldn’t want to look like Adele, am I right? During my search for this week’s copycat look I stumbled on a picture of Adele. I liked it, thought it was cute, but sort of breezed over it and kept browsing other celeb looks. 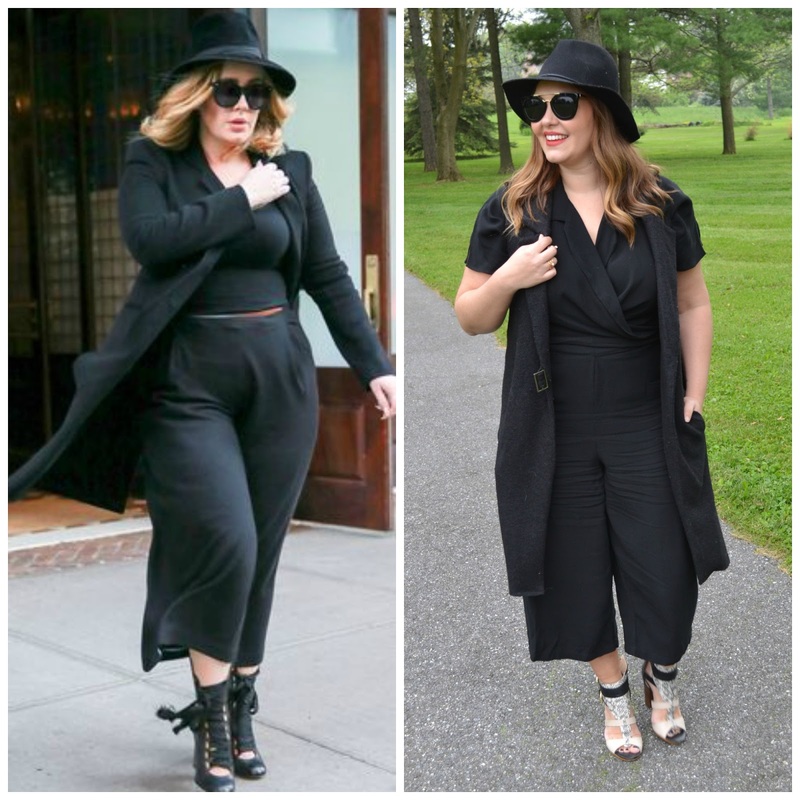 I kept going back to it though….probably because Adele is built a bit more like me than the Jessica Alba’s of Hollywood, and also- who can pass up a head to toe black look? It’s such a classic pairing, one that never goes out of style. One thing I love about recreating celeb looks is that I have free reign to make it my own. Like I said, I was drawn to this head to toe black- I knew I didn’t have a two piece set similar to Adele’s, but I did have this great jumpsuit that I knew would do the trick. Instead of strapping on my black, lace up heels I opted for a lighter, more spring like pair. I also didn’t feel the need to pair my jumpsuit with a jacket like Adele simply because of the time of year. You don’t have to twist my arm to wear a hat and sunglasses, that’s for sure! Any chance I get to top off my look with those accessories I take! You are rockin this look! Love it! I have thought for MONTHS that you look so much like Adele! How funny to see a side-by-side photo of you two!